The NBCUniversal WatchBack app is all new and features TV shows you love for Free! 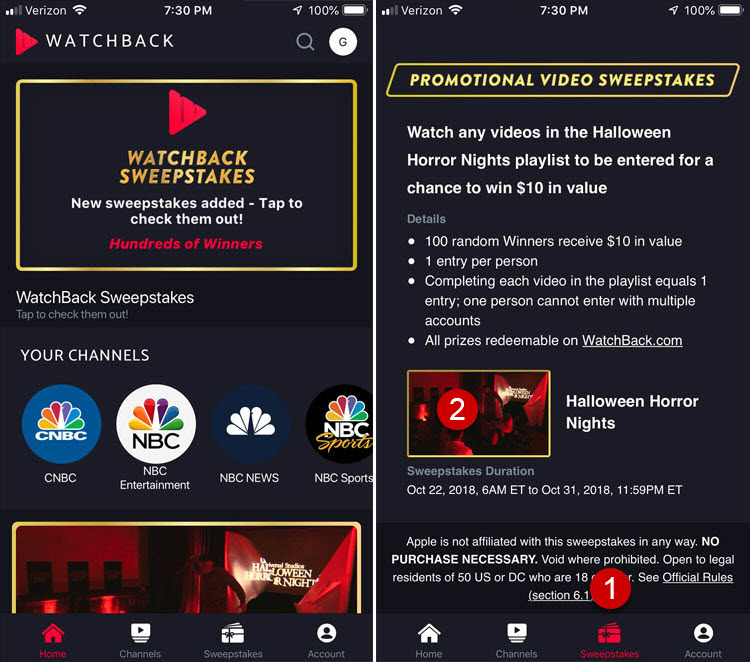 Download the Free NBC WatchBack app and Watch full-length shows under the Sweepstakes Tab for your chance to win daily or weekly prizes. By watching the show you are automatically entered. There is no need for a special code to enter. Kirstina said: it is worth it!! I was a daily winner in the Weekly sweepstakes. I won 50,000 points. I get to choose whatever $50 gift card I want. Thanks so much for posting!! Important! you cannot enter with multiple accounts. Prizes are given as Points which can be redeemed for Gift Cards from NBC partners including Amazon, Fandango, Target, and much more. Note: you must watch a featured show at least 90% completion or more for your entry to be valid. Re-watching a video that has already been viewed will not count as an entry; and fast-forwarding a video will also not count as an entry. Download the Watchback App on your mobile device (it’s free). Login in and tap the Sweepstakes tab at the bottom right. Tap a video and watch it. Check your history by tapping Account at the bottom right. Official Rules: Open to United States; 18 years of age and older. Begins on October 8, 2018 and ends on January 1, 2019. Drawing Date: weekly drawings. Entry Limit: one entry per person per show. One person cannot enter multiple times under multiple accounts. You can go back and watch shows you missed. A new show is added each week until January.